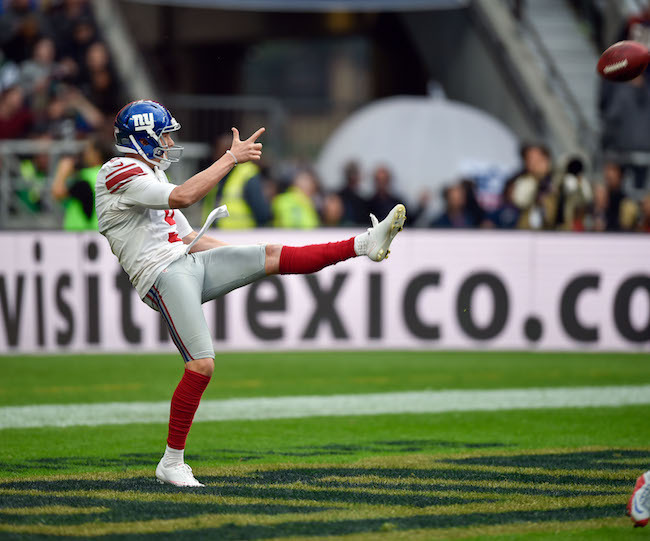 The New York Giants have terminated the contract of punter Brad Wing, who had signed a three-year, $6.45 million extension in July 2016. Wing had two years left on his contract with base salaries of $1.35 million in 2018 and $1.45 million in 2019. He would have counted $2.025 million against the 2018 salary cap. By cutting him the Giants “saved” about $1.025 million in cap space with $1 million in dead money. After a strong 2016 campaign punter Wing struggled in 2017, with poor performances being a factor in a few defeats. Wing saw his gross punting average fall from 46.2 to 44.1 and his net punting average drop from 40.9 to 36.7, which was the worst in football. His number of punts inside the 20 also fell from 28 to 19. Wing had two punts blocked. It was a precipitous drop for a player who had been named “NFC Special Teams Player of the Week” twice in 2016. An Australian, the left-footed Wing was originally signed as an undrafted rookie free agent by the Philadelphia Eagles after the 2013 NFL Draft. He did not make the team but he made the Pittsburgh Steelers roster in 2014. The Giants acquired Wing from the Steelers by trade for a conditional 7th-round draft pick in September 2015. Until 2017, Wing combined a strong leg with good directional placement skills. He also was the Giants holder for both field goals and place kicks. The Giants signed punter Austin Rehkow to a reserve/futures contract in January 2018. Rehkow was signed by the Buffalo Bills as an undrafted rookie free agent after the 2017 NFL Draft. The Bills waived him in August. He punted twice in the preseason, averaging 44.5 yards per punt. ESPN and The New York Post are both reporting that their sources say the earlier NFL Network report about the New York Giants moving cornerback Dominique Rodgers-Cromartie (DRC) to safety is not true. Apparently no such decision has been made. Giants have asked CB Dominique Rodgers-Cromartie to take a significant pay cut from the $6.5m he’s due in 2018, sources say. No final decisions made either way but DRC and the team are far apart at this point. The Carolina Panthers re-signed place kicker Graham Gano on March 6 to a reported 4-year, $17 million deal. There had been media reports that the Giants were expected to pursue Gano if he hit the open market on March 12th. The 30-year old Gano made the Pro Bowl for the first time in his career last season after he converted on 29-of-30 field goal attempts (96.7 percent). News and Notes Tagged with: Alec Ogletree, Brad Wing, Dominique Rodgers-Cromartie, Graham Gano, Odell Beckham Jr.
Running back Shane Vereen (calf), running back Orleans Darkwa (back), right tackle Bobby Hart (ankle), defensive end Olivier Vernon (ankle), linebacker Jonathan Casillas (ankle/wrist), and linebacker J.T. Thomas (groin) did not practice on Wednesday. Linebacker B.J. Goodson (shin) practiced on a limited basis. 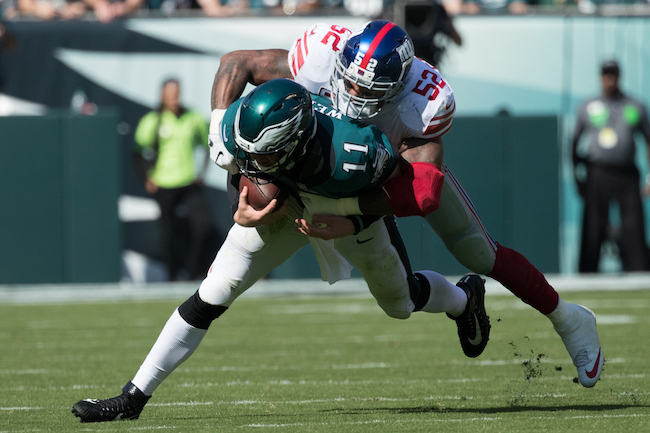 Defensive end Jason Pierre-Paul (core muscle) and safety Nat Berhe (concussion) have officially been ruled out of Thursday night’s game against the Philadelphia Eagles. 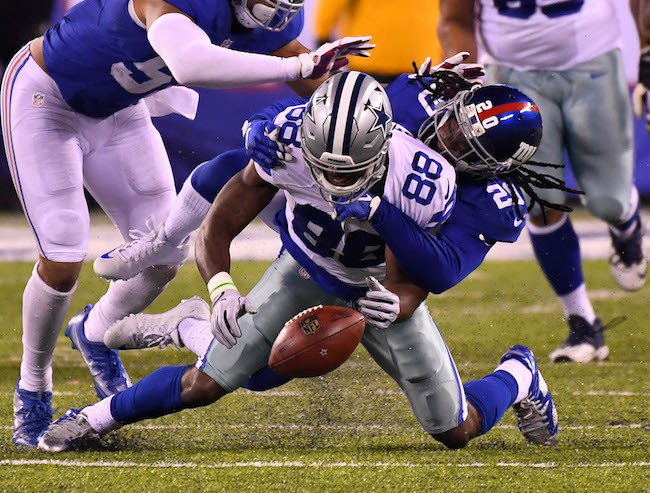 Cornerback Janoris Jenkins (back) and linebacker Jonathan Casillas (knee) are “questionable” for the game. Janoris Jenkins is listed as questionable for #NYGvsPHI. I'm told Jackrabbit is a gametime decision. Coming up at 4pm on @nflnetwork. Defensive end Owagmagbe Odighizuwa (knee), linebacker Keenan Robinson (shoulder), offensive lineman Will Beatty (lower leg), offensive lineman Marshall Newhouse (shoulder), and long snapper Zak DeOssie (hamstring) are “probable” for the game. 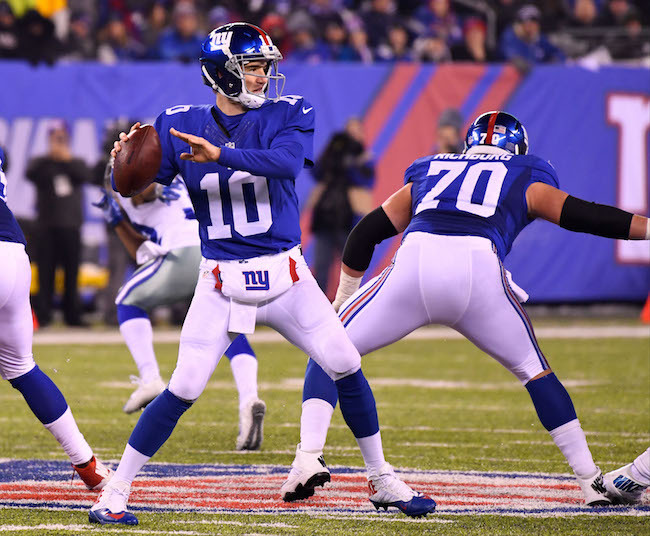 For the second week in a row, New York Giants punter Brad Wing has been named the “NFC Special Teams Player of the Week.” Against the Detroit Lions, Wing punted seven times, averaging 42.6 yards per punt (41.0 yards net) despite a partially-blocked punt that only traveled 18 yards. In addition, for the second week in a row, two of his punts were downed inside the 5-yard line. Detroit totaled just 11 punt return yards on four punt returns. Wing is the first Giants player to win back-to-back “NFC Special Teams Player of the Week” awards since they were instituted in 1984. 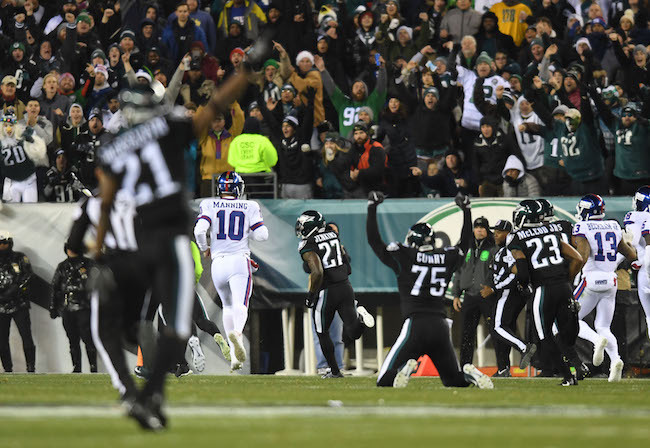 This is the third time a Giants player has won the award this year, with CB Janoris Jenkins earning the honors against the New Orleans Saints for his 65-yard touchdown return of a blocked field goal. 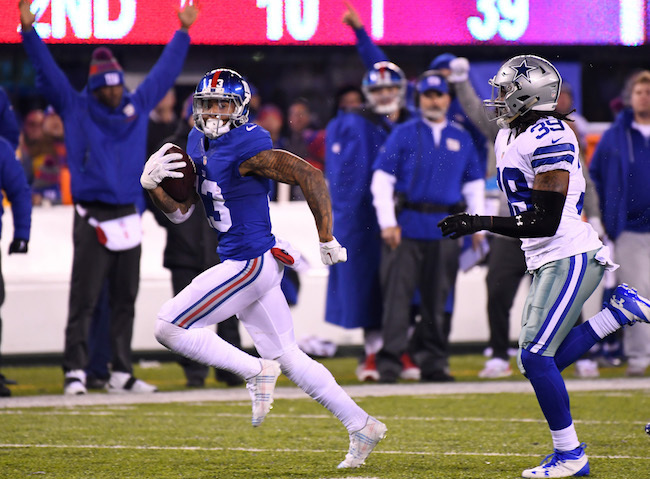 The New York Giants are averaging 81.2 yards per game. According to the Elias Sports Bureau, that is their lowest figure since they averaged 76.9 yards on the ground in 1945. The Giants have not had an individual 100-yard rusher this year. They last played an entire season without a 100-yard rusher in 1996. The Giants are one of five teams that has yet to score 30 points in a game this season (joining Chicago, Cleveland, Houston, and San Francisco). The Giants are allowing 17.9 points a game, the fewest they’ve given up since 2002, when their opponents scored 17.4 points-per-game. 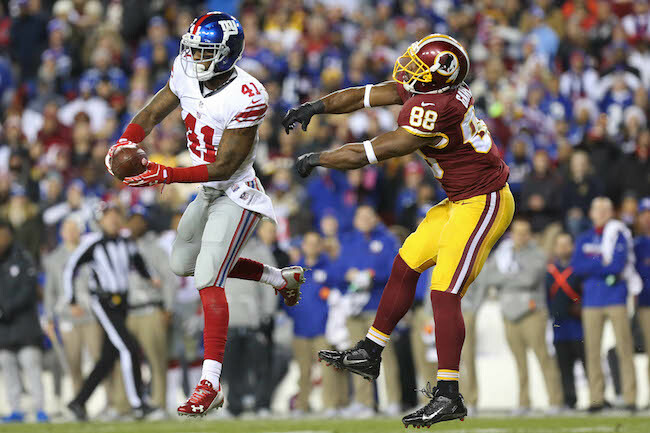 Giants opponents have scored touchdowns on a league-low 40 percent of their trips inside the 20-yard line (16-of-40). That is their best defensive red zone performance since 2001, when they gave up touchdowns 37 percent of the time. QB Eli Manning will play in his 200th regular-season game for the Giants on Thursday (and make his 198th consecutive start). He will become the fourth player in franchise history to play at least 200 games, following DE Michael Strahan (216), TE Howard Cross (207), and DE George Martin (201). Defensive end Jason Pierre-Paul (core muscle) and linebacker Keenan Robinson (shoulder) did not practice on Wednesday. Three players who are in the NFL concussion protocol – running back Shane Vereen, linebacker Mark Herzlich, and safety Nat Berhe – were limited to non-contact work. Defensive end Owa Odighizuwa (knee), defensive tackle Johnathan Hankins (shoulder), left guard Justin Pugh (knee), and long snapper Zak DeOssie (hamstring) practiced on a limited basis. 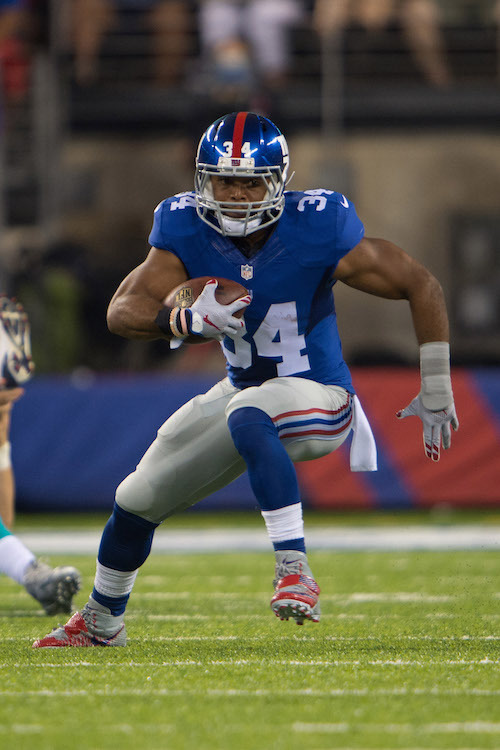 The New York Giants have signed running back Russell Hansbrough to the Practice Squad. Hansbrough was signed as an undrafted rookie free agent by the Tampa Bay Buccaneers after the 2016 NFL Draft. Hansbrough spent time on both Tampa Bay’s Practice Squad and 53-man roster before being cut in late November. Hansbrough is a speedy back who lacks ideal size. 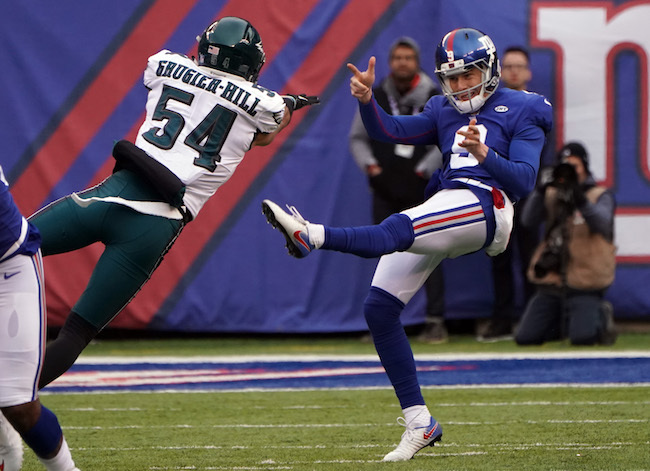 New York Giants punter Brad Wing has been named “NFC Special Teams Player of the Week” for his performance against the Dallas Cowboys last Sunday night. In that game, Wing punted nine times, averaging 43.2 yards per punt (42.9 yard net). Five of Wing’s punts were downed inside the 20-yard line and two at the 3-yard line. The Cowboys only returned three punts for three yards. Wing is the first Giants punter to receive the “NFC Special Teams Player of the Week” award since Jeff Feagles in 2005. 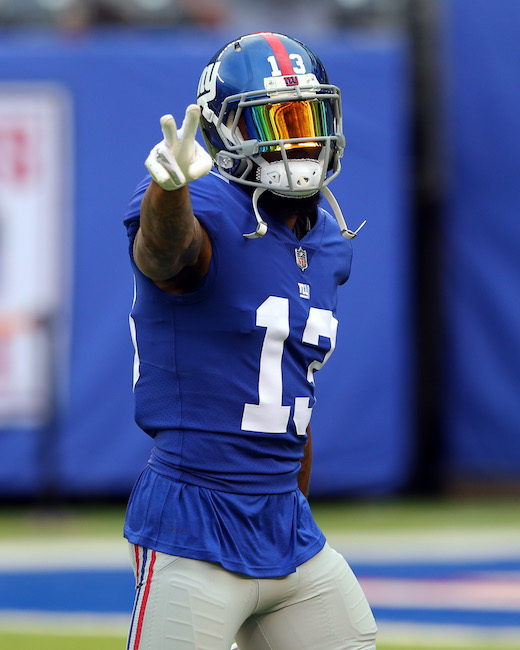 The Giants practice at 12:20PM on Thursday. The coordinators will also address the media. The New York Giants have re-signed offensive lineman Adam Gettis to the Practice Squad. The team also terminated the Practice Squad contracts of running back George Winn and offensive lineman Laurence Gibson. Gettis was cut on Saturday to make room for running back Shane Vereen to be activated from Injured Reserve. Gettis was originally drafted in the 5th round of the 2012 NFL Draft by the Washington Redskins. He has spent time with the Redskins (2012-2013), Steelers (2014), Giants (2014-2015), Raiders (2015), and Giants again (2015-2016). Gettis was signed to the Practice Squad in September 2016 and to the 53-man roster in November 2016. Winn was signed to the Practice Squad in November 2016. Winn was originally signed by the Houston Texans as an undrafted rookie free agent after the 2013 NFL Draft. He has spent time with the Texans (2013), New England Patriots (2013), Oakland Raiders (2013), Pittsburgh Steelers (2013), Dallas Cowboys (2013), and Detroit Lions (2014–2016). Gibson was signed to the Practice Squad in September 2016. Gibson was originally drafted in the 7th round of the 2015 NFL Draft by the Dallas Cowboys. He has spent time with the Cowboys (2015), Chiefs (2015), Falcons (2016), and Bears (2016). The players return to practice on Wednesday in preparation for Sunday’s home game against the Detroit Lions.